Do you know how our hair is structured? Many women don’t know, but our hair is basically keratin, a kind of protein that is also responsible for the formation of the outer layer of the skin and even our nails. First, as you may already know, the place where each hair comes out is called a follicle, which has the shape quite similar to a tube, but with a broad, rounded bottom, as you can see in the image below. In this wide and rounded bottom the hair the bulb is found. There, the hair is born. For this to occur, through the bloodstream, the capillary vessels send the nutrients necessary for capillary development to the dermal papilla, which is below the bulb. The papilla is feeding the bulb a set of germ cells – including the melanocytes, which produce the melanin. This set of cells is called matrix, responsible for hair growth. This is the outer layer of the hair, which is very fine and colorless. Its primary function is to protect your hair from the action of external factors. Other famous cuticle enemies are the dryer and the excess use of brushes and different hairstyles. Excessive heat breaks the cuticle protection and causes severe damage to the cells of the hair shaft. Pantene scientists are experts in dealing with the loss of the protective cuticle layer and have developed unique Pro-V formulas for their Shampoos, Conditioners and Treatments that repair the damage, seal the cuticle and restore the hair’s natural radiance and softness. It is the so-called middle layer, where it is possible to find the melanin, responsible for the color. This is the layer that determines the shape (texture) of the strands. There are 2 distinct sub-types of melanin which are combined in different proportions. This explains why there are so many varieties of color. The first sub-type is eumelanin, responsible for the black and dark brown pigments. The second one is the pheomelanin, which forms almost exclusively red hair. The mixture of the two and the smaller amount of them causes light brown hair, blond and intermediate. White hair: Genetics plays the most important role in defining the initial time and the number of white hairs. But what is its cause? Over time, the cells that produce the melanin pigment decrease their activity. The renewal of pigment cells is extinguished. At age 50, an average of 50% of people owns 50% of white hair. This is the innermost layer of the hair shaft, but is not present in all hair. This nearly invisible layer is the softest and fragile, and it is responsible for the distribution of nutrients and for the adequate and efficient infiltration of these in the other layers. As mentioned above the hair follicle is the part where the hair grows. 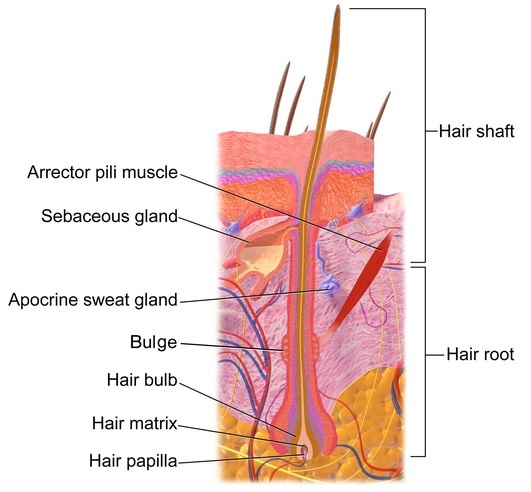 Did you know that the hair follicle is also responsible for the shape of your hair? It is the shape of the follicle which contributes to determining whether your hair is straight or curly. 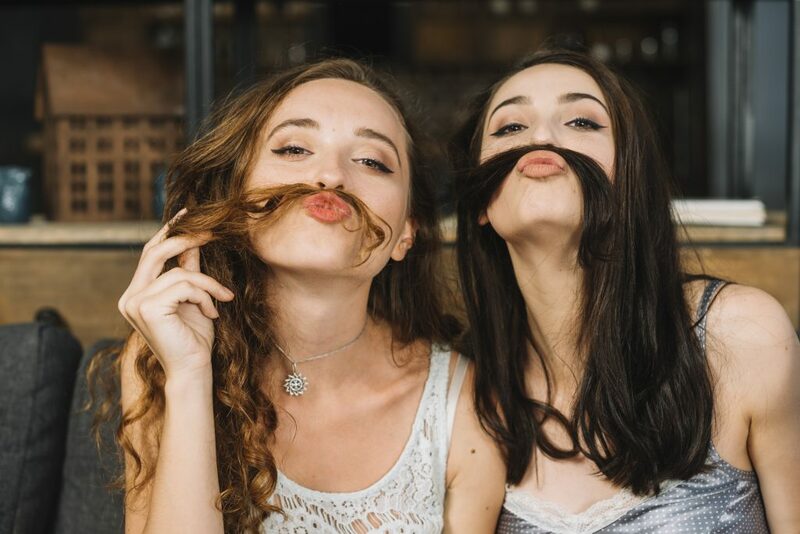 If the follicle is round, hair will tend to grow straight, while an oval follicle will give wavy hair and a hooked or elliptical-shaped follicle will give you curly hair. The angle at which the hair grows out of your skin also affects your hairs’ curliness. Straight hairs tunnel vertically down into your scalp, while curly hairs tunnel in at an angle. This can also affect how oily your hair is, as hair growing at an angle can make it difficult for your natural oils to spread through your hair. That is why curly-haired people may find they don’t have to wash their hair as often as straight-haired counterparts. While this is a great benefit of having natural ringlets, curly haired-people also may encounter scalp irritation and dandruff more. There is a system, called Andre Walker Hair Typing System to classify different hair types. According to his system, the hair is divided into 4 main groups. 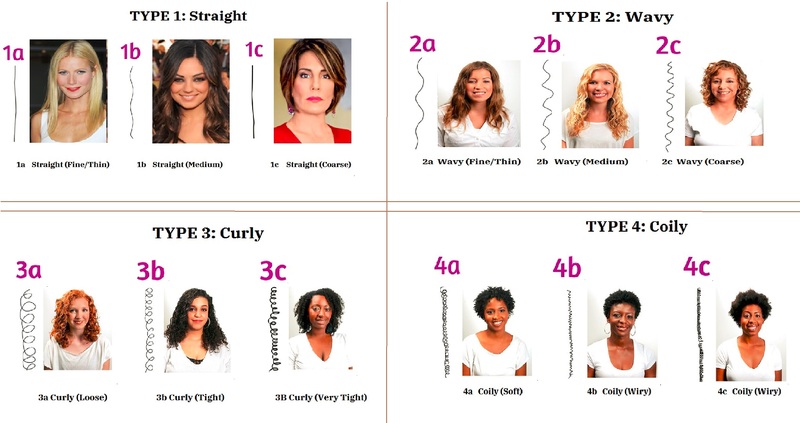 This group refers to the curvature of the hair, so number 1 is the type of straight hair, where number 4 already covers the curly hair. There is a second classification, which is represented by letters (a), (b) and (c). They are responsible for pointing out the different textures that the hair itself may have, being thicker or thinner, for example. 1a Straight (Fine/Thin) Hair tends to be very soft, shiny, oily and poor at holding curls, but difficult to damage. 1b Straight (Medium) Hair characterized by volume and body. 1c Straight (Coarse) Hair tends to be bone-straight and difficult to curl. Common in Asian women. 2a Wavy (Fine/Thin) Hair has a definite “S” pattern and is usually receptive to a variety of styles. 2b Wavy (Medium) Can tend to be frizzy and a little resistant to styling. 2c Wavy (Coarse) Frizzy or very frizzy with thicker waves; often more resistant to styling. 3a Curly (Loose) Curly hair that usually presents a definite “S” pattern and tends to combine thickness, fullness, body and/or frizziness. 3b Curly (Tight) As 3a but with tighter curling like a spiral. 4a Coily (Soft) Hair tends to be very fragile, tightly coiled and can feature curly patterning. 4b Coily (Wiry) As 4a but with less visible (or no) curly patterning. Did you find your type? Tell us, which one is yours in the comment section. Usually, we hear that hair loss is normal situations by which every woman passes through life. However, this may not always be true, taking into account that there are some – even serious – health conditions that can lead to the development of these problems, such as deep anemia and hereditary baldness, for example. On the other hand, hair loss and slow hair growth can also be linked to some even temporary circumstances and can be avoided with just a few changes in the daily routine. Among these changes is the diet, which, needs to be balanced and rich in nutrients capable of promoting good health of the scalp and hair fiber. Also, maintaining proper hygiene and treatments for your type of hair is also essential if you want to have healthy, strong, beautiful and long hair. If you can keep all these changes and make them part of your routine, surely you can have well-cared and long strands without any difficulty. “But what if I’m doing all of this already and my hair still keep falling?” There, you may be dealing with another very common, natural condition: the life cycle of the wires. In another post here, you have already learned about the life cycle of your hair, which is nothing more than the transition phase that our hair passes from its birth. Like all humans, our hair also has a life cycle: hair is born, grow, and fall. After they fall, they begin a new cycle, with the birth of new hair, which will go through the same steps mentioned. It happens to everyone, and you do not have to worry if this is your case. However, it is worth mentioning that this loss can become a cause for concern when the fall exceeds the amount of new hair that is born.